New to Facebook ads? Well, you are at the right place. Having looked over 500+ Facebook Ads, I have realized that there are certain dos and don’ts you have to play by the rulebook in Facebook advertising. And truth be told, these ways and methods are no secrets as they lie in plain sight. In fact, they are built on the 4 key elements of making a Facebook Ad which are its image, text, call-to-action button and of course a spice of some good ol’ psychological marketing tricks in value proposition. 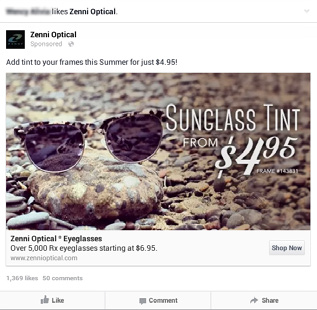 But before we proceed, it is important for you to factor in the placement of your Facebook Ad. Will it be on the right-hand column or is it going to be on the news feed? Also, who are your target audiences? Are they 30 to 40-year-old soccer moms or maybe general couch potatoes? Anyhow, you’ve to be aware of irrelevance because it is a downfall for any advertisement. Nevertheless, this can be prevented by crafting a detailed buyer persona and have your ads design cater towards them. First and foremost, a picture paints a thousand words. 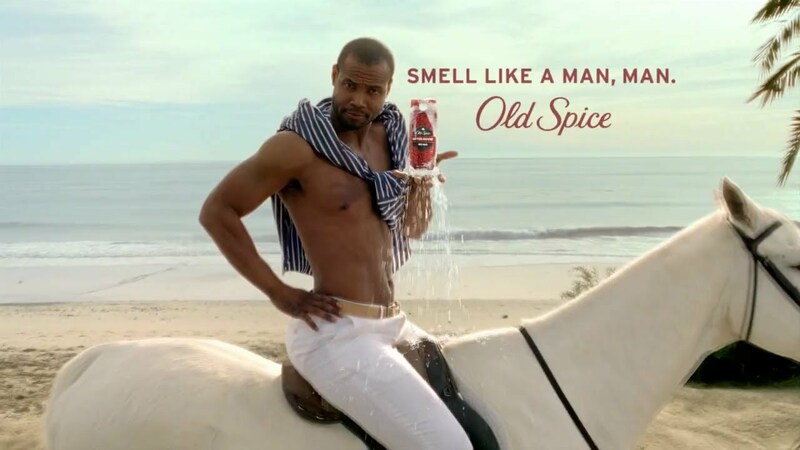 Or maybe you more likely know him as the “the Old Spice Guy” or “the Man on a Horse” from the commercial. This is one of the classical metaphor-based advertising which likely evokes a favorable attitude towards the product. This is because in this image while Old Spice is a perfume, it is portrayed beyond that, sending a message which induces that your man may smell like a man if you choose to use the Old Spice product (with an added Prince Charming effect as a bonus). Even for the non-female clientele, it possesses a sense of humor and wittiness which makes the image memorable. Besides that, image has become ever more vital with Facebook Q3 2015 Results showing that Facebook users have switched to mobile platforms. The report says that on September 2015, 893 million Facebook users have to access their Facebook accounts through their mobile devices. And the numbers keep increasing, with an expecting 27% increase annually. Hence, taking media platform into consideration, a mobile device as compared to a desktop screen is 2 to 3 times smaller in size which means no teeny-tiny text as godly written as they are can attract Facebook users’ attention as compared to a picture of tinted sunglasses sitting on a rock. But with the intense competition of most advertisements focused on images, as well as the competition of news feed ads with the Facebook user’s own feed of pictures of friends and family. The question lies in how can you create an image which is more eye-catching or more click-inviting? Paying attention to technical specifications is important as you’d not want to have your image resize. In this aspect, Facebook has specific guidelines that you ought to follow. An image with text is also more effective than an image without text. Because as far as a picture is worth a thousand words, text enhances an image by steering them in the right direction. But it is best if we do not overdo it. In this sense, I still like to abide this once-upon-a-time rule on Facebook which is the 20% text image rule. Because even though Facebook has lifted the 20% text rule and images with more than 20% overlaid-text have received the green light, too much text on an image will make an image too busy. Not to mention that the scattering words will distract viewers attention from the protagonist of the ad. With no focus point for viewers, they are more likely to just skip the advertisement. On the other hand, including a brand statement or logo in the advertisement image itself can be useful to promote branding, but remember to do so in a limited space. Going minimalistic is the key to making a successful ad. In addition, do not miss out on the profile image as well. As small as it may be, associating a certain image with a product and or service is essential in establishing a brand and even an agenda. Take Rosie the Riveter here, you might not have known who she is but you most likely has seen her iconic red bandana and flannel shirt. A representation of gender equality, Rosie has become the iconic emblem of feminism. Similarly, stick to one profile image and have it symbolize your business. Furthermore, branding is important as it is the very reason that people tend to overpay. An experiment by AdEspresso has shown that real-life pictures versus illustration yielded different results in different situations. The test was conducted having split-tested different images of illustrations against real-life images and having discovered that they outperform each other in different scenarios. There were basically two split-tests, both had real-life images placed against illustrations. For the first promoting a lead generation guide, the illustrated ebook on the right as shown below got a higher click rate. Then again, when it comes to a split-test for the 500+ Facebook Ads image, the one with a real-life image got a higher click rate. Though this can also be said to be contributed by the human element. Instead of placing just a picture of your product, why not place an image of people using your product or services. The human element has been said to be one of the must-haves in an effective advertisement image. The advertisement by FortisBC above shows one of the most effective Facebook advertisement and the reason lies in the image – A picture of a smiling woman. It does not necessarily have to be an attractive woman, but an image of a woman smiling looking directly at the camera is said to be most effective in advertising. You may ask why? The reason is simple, that is because smiling is one of the most positive emotional gesture which can reel in more clicks than anything. Just Imagine Mona Lisa and her smile which has won international attention. Also, instead of placing a single image, why not try multiple images. Multiple images provide more selections and choices to attract the buyers. If you are not attracted to this coat in black, you might like it more in brown or blue. In a way, it is similar to the workings of AKB48. On a plus side, multiple images can also tell a sequential story in advertising which can attract viewers’ attention. As for color choices, remember to avoid blue and white as they are the two main color themes of Facebook itself. Also, Canva advises choosing bright and light colors instead of dark colors, the same goes with the filter. Additionally, images created should be centered on your product or service. For as tempting as inserting a surprise element into your images and headlines may catch the attention of Facebook users. But do remember, in the end, it is not just about the click rates but the sales rates as well. The superiority of visual images however does not mean that text comes secondary, instead, words above the image are equally as important. As described above, words serve to further explain the image. For instance, will you understand that Old Spice is a men’s cologne without the words “Smell like a man, man”? This is because words provide clarification and play an essential role in further reinforcing the message of the image. Besides that, it is ultimately the right choice of words that leads to a buyer’s decision-making in conversion. In this case, you have to take into consideration who are you writing to as to address their different needs and expectations. Notice the two different text above the image, although both promotes a Facebook Ads Manager, the text on the right aimed for business startup propose the value of boosting startup growth. On the other hand, the text on the right aimed at media outlets communicates another benefit of using the Ads Manager, that is the management of agency customers. In other words, this also means that it is important for you to be practice minimalistic writing while being straightforward in addressing your point and to prevent over-decorating your text. Too much unnecessary text causes readers to skim or skip through the text. Besides, the psychology of language says that fewer words build trust. Even so, if you have written beyond the 90 text character limits, it can still be work around using ‘Power Editor’ which allows you to include more text. Regardless the number of words, when you write do keep in mind that every word bounds a different meaning in weight and social or cultural meaning. Quoting the slogan from one of my favorite books, Animal Farm. George Orwell said that “All animals are equal, but some are more equal than others”. The same principle applies to words as well with specific words more powerful than the others. For example, using the word now instead of its synonyms ‘immediately’ or ‘this minute’ not only save you text characters. More importantly, it is short, sweet and concise. Though the study has later been proven to be fictitious. In the end, these words still bear importance as they are persuasive in business writing, especially the 5 words of “you, free, instantly, because and new” further elaborated here by Copyblogger. Do you like chocolates and free stuff? Well, if you do, are you in for a treat. Here is a study conducted using chocolates, specifically Lindt truffles and Hershey’s kisses. The experiment started off with Lindt Truffles sold at 15 cents per piece while Hershey Kisses was sold at 1 cent per piece. While there is a huge difference in price, the much tastier Lindt truffles sold out at a higher percentage of 73%. At a later stage, the chocolates were sold at a different price whereby both treats were reduced by 1 cent wherein Lindt Truffles is now sold at 14 cents while Hershey Kisses is basically free-of-charge. The change in price also caused an unexpected outcome on their sales. For being free has practically made it price-less as from the same crowd of people, 69% now chose the Hershey’s Kisses over the Lindt Truffles. This is a result of the zero-price effect or basically the word “free”. Take this scenario, for example, Lindt Truffles is still tastier and even cheaper at one point, but why do people go for the Kisses? Placed in a marketing perspective, if you are given the choice to go to Paris or Rome, which will you choose? Given that both choices weigh equal, most will have a hard time choosing, but throw in a free breakfast for the trip to Paris, the choice would be made obvious. 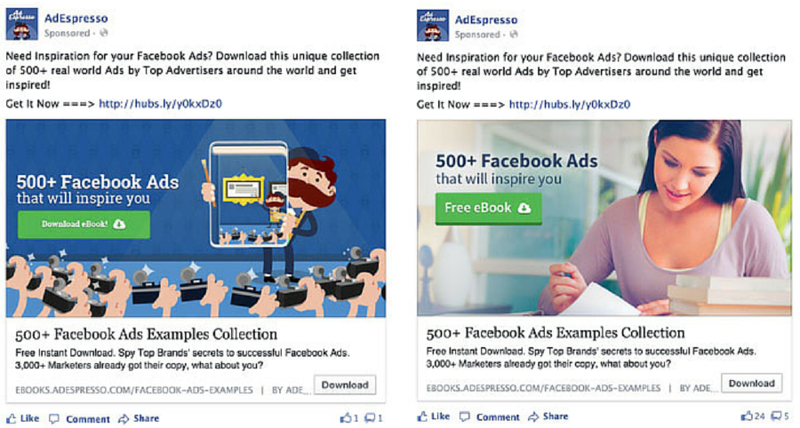 But, do not mistake value proposition in Facebook advertising as just about giving freebies. It can be a message that expresses certain benefits whether it is in terms of convenience and affordability. In this case, sharing a great recipe or guidelines to writing is also an example of value proposition. Last but not least, call-them-to action. For when it comes to inserting a call-to-action button, ‘to include, or not to include – that is the question’. And sadly, there is no definite answer as it varies depending on the objective of your advertisement. That is to say, if it is an announcement, it is not likely that a Call-To-Action button is needed. 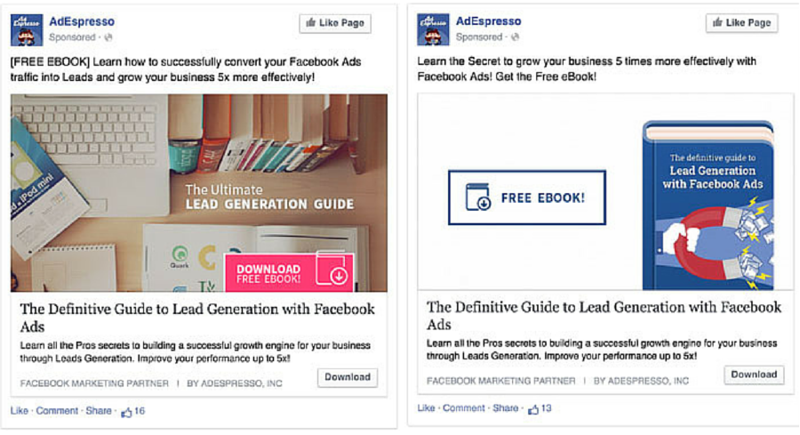 Then again, to not include a CTA button has been said as one of the worst facebook ad mistakes. Do however bear in mind that some CTA buttons tend to work better than others and those used by top-performing ads are often “Learn More, Shop Now and Sign Up”. But most importantly, your call-to-action button must meet the expectations of the people. If they have clicked on it expecting to see the new Mercedes SUV, don’t land them on the homepage instead. Show them what they came for. Yet, regardless how you design your facebook ad, the answer to the real success of a Facebook ad is for you to design it based on your target audience. Also, do remember to always stay in an A/B mindset and never stop experimenting with the four elements above. You can find out why and how right here.